Buy through MusicWeb for £14.80/15.30/16.20 postage paid. While the sound of the Hilliard Ensemble is instantly recognisable, so is their repertoire. It dates from the medieval with composers like Perotin, and with a wide and varied repertoire by composers living today – notably that of Arvo Pärt. What then of the 18th century? The riches of composers such as J.S. Bach seem to have been barely touched by them. When asked why baroque music played such a minor role in their programming, Gordon Jones stated that these composers “are very unusual, sitting there in the 18th century. 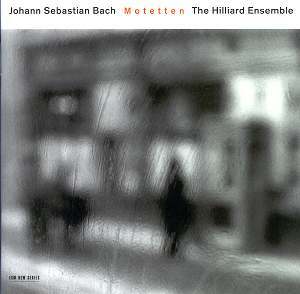 We don’t have much music from the time between Monteverdi and the late twentieth century, mostly because of the vocal ranges involved and also because very often you need accompanying instruments, so that’s not an area we get into very much.” Indeed, only Lobet den Herrn, alle Heiden receives a discreetly played organ continuo on this recording, where the tradition has more often been for accompaniment throughout. This helps with tuning and clarity with larger choirs, but with the single voice to a part approach taken by the Hilliards the clarity is in-built, and they have enough expertise in this field to make drifting off-key an unlikely state of affairs. Words are an essential element in the Hilliard’s approach, and the articulation in these recordings is accurate almost to a fault. The words drive the rhythm and line, just the way Bach wrote for them. Those of you who know and love the Hilliard ‘sound’ will probably already be making a bee-line for the nearest outlet, and with ECM’s usual beautiful recording, made in the now familiar acoustic of the beautifully situated Propstei St. Gerold in Austria you know it makes sense. The addition of female soprano voices widens the range of the ensemble, and means that the overall sound is less dependent on the countertenor voice, which is a characteristic of Hilliard that has divided opinions in the past. Of the alternatives which are more easily obtained, Herreweghe and the Collegium Vocale Gent on Harmonia Mundi from 1999 has to be near the top of any heap. Sir John Eliot Gardiner and the English Baroque Soloists and Monteverdi Choir on Erato from 1993 are good as well, with a grander approach spread over two discs and a couple of Cantatas thrown in for good measure. The Sixteen with Harry Christophers on Hyperion from 1993 are a little closer to the smaller scale, almost chamber versions on this new ECM disc, but with organ accompaniment throughout there’s not really a direct comparison to be made with any of these. The only question then is one of taste. The a cappella Hilliard Ensemble can take a little getting used to in this recording, and if you like your Bach large-scale but more restrained you might find this recording a little ‘busy’ to start with. The moments of repose are gorgeous of course, just taking something like Denn das Gesetz des Geistes from BWV 227 almost at random, and there is all of the beauty of line and atmosphere for which you could wish. Sampling the opening of the famous Singet dem Herrn ein neues Lied and you might be a bit put off to start with. We’ve become used to stronger bass lines helping the harmonic progression in these pieces, and the active articulation and sheer mass of lines and directions might seem a bit much to take in. This is not a ‘music for the millions’ version of these works, and you need to make just that little but of extra effort to enter the new worlds of sound being created. The music speaks to the listener in a different way; more directly. Once inside the musical language of the Hilliard Ensemble however, there are indeed treasures to be discovered. Just for fun, I unearthed my 1964 Bärenreiter edition of the autograph manuscript of BWV 226, two pages of which are reproduced in the CD booklet – a rich and informative document by the usually more enigmatic standards of ECM. The sense of telepathy, time-travel or whatever you want to call it is very strong with these performances. Bach may not have heard these works in quite this way when he was alive, but I’d bet my urtext he’d have loved every moment.